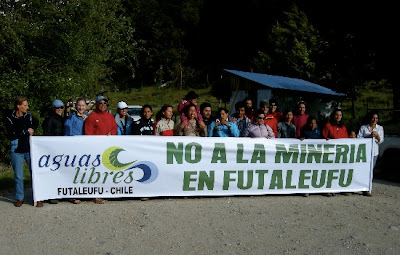 [Jan 4, 2007] Region X’s pristine Lago Espolon was the site last weekend of a protest aimed at keeping international mining companies out of Chile’s Patagonia. Kayaks, rafts and ferryboats - provided largely by local adventure companies - traveled across the lake on Saturday, December 29 to alert local residents of the decision by two transnational gold mining companies to reactivate their Patagonia mining project. Geocom Resources Inc. of the United States and Kinross Gold Corp. of Canada recently reactivated their Geocom-Kinross Gold Mine project - located on 225,000 acres (or 350 square miles) of the Espolon Valley. The gold mine project would use a cyanide extraction process that creates acidic runoff that could poison the area’s pristine lakes and rivers. Espolon Valley is near the Argentine border, upriver of the Rio Espolon, which flows into Rio Futaleufu. Each of these water sources are tributaries for the town of Futaleufu, Lago Yelcho, Rio Yelcho and numerous communities all the way to the port city of Chaiten. The residents of Espolon and the river community gathered Saturday to share a barbeque and express their disapproval of the proposed mining. Public speakers from the neighboring community of Esquel, Argentina - which recently defeated the proposed Meridian Gold mine - also came to share information and offer advice. Residents on both sides of the border fear the proposed gold mine will contaminate the waterways and have a serious impact on the environment, economy, and health of the local population. Speakers noted that in addition to the toxic wastes that gold production would put into the local waterways, mine blasts fog the air with dust and debris. This not only pollutes the air, but also settles on vegetation and glaciers. If dirt is allowed to build up on the glaciers, it could lead to their dehydration – ending another source of water for the community. Lago Espolon and Rio Espolon are also fertile spawning grounds for trout and salmon, said the speakers. Not only are they a source of food and for salmon exports, they also attract tourism from around the world. Rio Futaleufu is also home to what is arguably the best whitewater rafting and kayaking in the world. Each summer people from around the world come to experience the area and subsequently boost the local economy.